For the butterfly, see Hesperocharis nera. Nera D. White (November 15, 1935 – April 13, 2016) was an American basketball player. White played in the AAU national tournaments for the Nashville Business College team while completing her education at George Peabody College for Teachers, which did not field a team. Later, she led the United States national women's basketball team to their victory in the 1957 FIBA World Championship. Throughout her career, she was awarded numerous accolades, including her induction to the Naismith Memorial Basketball Hall of Fame and the Women's Basketball Hall of Fame. Playing at a time when there were no major professional women's basketball leagues in the U.S., White distinguished herself, receiving many accolades as one of the greatest female players in history. Talented in multiple sports, she also was distinguished as an All-World player by the Amateur Softball Association. White was born in Macon County, Tennessee to Horace White, a teacher, coach[clarification needed] and farmer, and his wife, the former Lois Birdean. White attended the George Peabody College for Teachers (now part of Vanderbilt University), along with Sue Gunter and Doris Rogers, both of whom went on to play for the United States women's national basketball team. She completed all of the undergraduate requirements for a degree in education except for the student teaching requirement, which she was unable to complete due to shyness. George Peabody did not have a women's basketball team, so she played for the Amateur Athletic Union (AAU) team in Nashville sponsored by Nashville Business College. 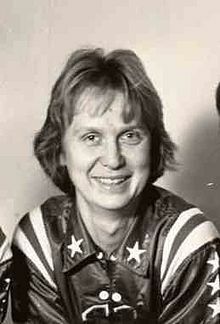 White was named AAU All-American for 15 years in a row from 1955 to 1969, and she led the Nashville Business College team to ten AAU national championships during that period. White was named the MVP of the AAU National Tournament nine times. While she played for Nashville Business college, the team once had a stretch of 92 games where they won 91. White was "widely acknowledged as the greatest woman ever to play the game". In 1966, Harley Redin (head coach of the Wayland Baptist Flying Queens, the dominant team of the 1950s) called her the "greatest woman basketball player in history". Hall of Fame player and coach Sue Gunter said that White was the best of the best. In addition to her basketball prowess, White was also an accomplished softball player. She was honored as All-World in 1959 and 1965 for the ASA Fast Pitch softball team. She played centerfield, shortstop and pitcher. White was the first woman to ever circle the bases in ten seconds. In 1957 White led the US national team to winning the World Championship. The World Championship game was against the USSR, the first time the USA had faced the USSR in a major competition. The USA came into the final with a single loss to Czechoslovakia, while the USSR was undefeated. The USA team was down by three points at the half, but came back in the second half to win the championship 51–48. White was the leading scorer on the USA team, averaging 14.1 points per game. White was named the MVP of the tournament, and voted the Best Woman Player in the World. White was enshrined in the Naismith Memorial Basketball Hall of Fame in 1992 and in the Women's Basketball Hall of Fame in 1999. White is one of only two players inducted into the Naismith Hall of Fame based on AAU accomplishments, the other being Joan Crawford. At the turn of the century, Sports Illustrated for Women identified the century's greatest sportswomen. Nera White was named 51st on the list of all sports, and is the sixth highest basketball player on the list, behind Cheryl Miller, Teresa Edwards, Ann Meyers, Nancy Lieberman and Anne Donovan. The high school gym in her hometown, Lafayette, Tennessee, is named after White. A local highway (State Route 10 North) has been renamed Nera White Highway. White died on April 13, 2016 at a hospital in Gallatin, Tennessee from complications of pneumonia, at the age of 80. ^ a b c Deitsch, Richard. "51. Nera White, Basketball". Sports Illustrated. CNN. Retrieved May 2, 2010. ^ a b "Second World Championship for Women – 1957". USA Basketball. Archived from the original on April 24, 2012. Retrieved August 19, 2009. ^ "Nera D. White". Naismith Memorial Basketball Hall of Fame. Archived from the original on September 11, 2012. Retrieved May 27, 2009. ^ "Nera White". Women's Basketball Hall of Fame. Retrieved May 27, 2009. ^ "Nera White". Tennessee Encyclopedia. Archived from the original on June 10, 2007. Retrieved May 27, 2009. ^ Prock, Jenna. "Tigerettes Finally Beat Lady Dawgs". Macon County Times. Archived from the original on February 19, 2012. Retrieved April 14, 2016. ^ Organ, Mike (April 13, 2016). "Basketball icon, Tennessee native Nera White dies". The Tennessean. Retrieved April 14, 2016. Grundy, Pamela (2005). Shattering the glass. New Press. ISBN 978-1-56584-822-1. Ikard, Robert W. (2005). Just for Fun: The Story of AAU Women's Basketball. The University of Arkansas Press. ISBN 978-1-55728-889-9. Porter, David L., ed. (2005). Basketball: A Biographical Dictionary. Greenwood Press. ISBN 978-0-313-30952-6. This page was last edited on 12 December 2018, at 00:04 (UTC).